The active verb “to celebrate” is not the same as “to commemorate”. Commemoration implies the exertion or practice of our memory; it calls to the remembering of something that is significant to a single person or a group of people. I believe it is important to linger on this distinction considering that on March 8th I repeatedly heard these two phrases: “Congratulations on your day” and “Congratulations for being a woman”. Naturally I was not the recipient of these praises, since I am a heavily bearded and somewhat sturdy man; nevertheless I repeatedly heard these words both on the radio and in the cafe I usually go to work in. Even though they respond to the “International Women’s Day” –universally declared by the United Nations- such commemoration does not originally refer to all the women in the world. I believe March 8th immortalizes a bold, daring, and brave group of women who fought for a set of ideals and rights that were not yet enshrined in our modern societies. The 1911 fire in Triangle Shirtwaist Factory in the state of New York moved the hearts of people all over the globe, for this tragedy exposed the precariousness and fragility in which women exposed themselves daily in private and public spaces. One hundred and five years have not passed fruitlessly. In Chile, women have conquered an array of political and social rights that have -in part- corrected their historically disadvantaged position in society. The multiple abuses and the asymmetrical circumstances existent between men and women have decreased over time, for these social anomalies have been present in our culture and social structures for far too long. Yet we can all agree that we have a long road ahead towards gender equality. This year I had the privilege of commemorating “Women’s Day” with a wonderful group of peasant women in Paillaco: a rural village in the south of Chile. Paillaco uncovers the light and the dark present in the life of many Chilean women. This township, located in the region with the highest rates of violence against women in the country, drags a sad history of mistreatments and abuses. Therefore, it is not a coincidence that Paillaco became the first municipality in Chile to inaugurate a Center for Women (Centro de la Mujer), dedicated to support and aid abused women. During 2014, in less than two moths, two homicides alerted the community to act upon a situation that seemed untenable. This reveals the reality and the dark surroundings of rural Chilean women. 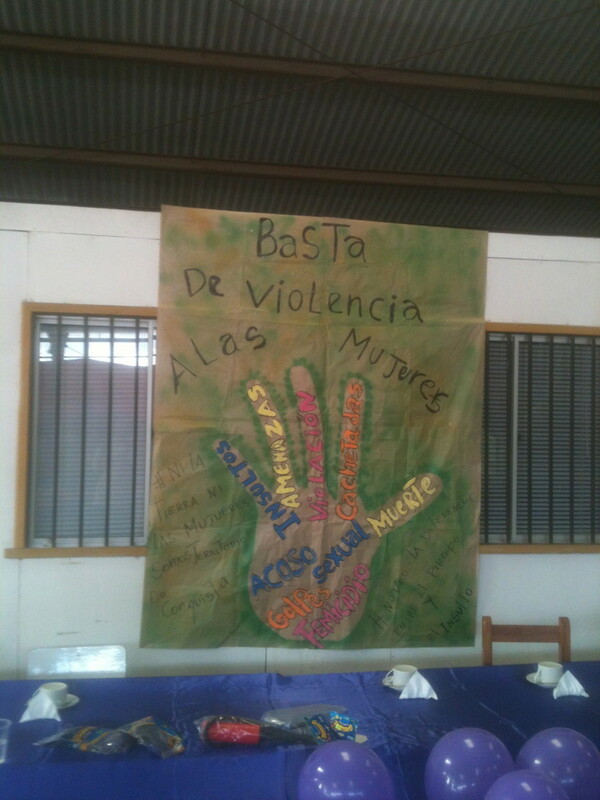 It is a social pathology that befalls to one out of three women in the country according to the statistics of the National Service for Women or “Servicio Nacional de la Mujer” (SERNAM), victims of physical, sexual, and/or psychological violence. 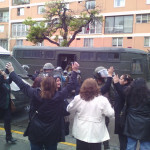 Due to incessant arrangements made by the city’s mayor, Paillaco has the first “Centro de la Mujer” in the country out of 23 “Centros” originated by the current administration led by President Michelle Bachelet to abused women. Yet, the dark lives with the light; these atrocities coexist with a promising and enlightened local initiative. Paillaco now has the first public educational program aiming towards gender equality from preschool to high school: developing and implementing workshops involving students, parents, teachers, all following a solid curriculum that assess students undergoing gender issues. The proud city of Paillaco is commencing a profound path of social transformations through education. If I had to tell a story that would reflect faithfully chiaroscuro phenomena in the present life of fighting Chilean women, I would speak of doña Rosa Barrientos Torres, a 90-year-old peasant. All of us, attendees to her commemoration, applauded in her honor due to her fortitude, tenacity and resilience against adversity. During the macabre coup of September 11th 1973, Rosa’s husband was killed together with 16 other peasants in the vicinities of Paillaco. The democratically elected president was being overthrown, and Rosa, alone faced distress and abandonment with nine children to be taken care of. Relentless in her struggle to feed, dress, and educate her children, Rosa managed to work day and night tackling deprivations, fear, and anguish for losing her life companion. The luminosity of her story comes with her message, which she shared with us that day: The struggle for a better living shall continue without hesitations. Forgiveness and reconciliation shall be our guide towards reaching true peace. Her wish was that her story served as an example of what shall never happen again, because life is a miracle that is well above all political, religious, economical or social considerations. At that moment, the room was static and speechless. I witnessed faces filled with emotion, watery eyes in all of us present. It was then when I understood the beauty, the powerful moral and righteousness of the courageous women that deserve to be commemorated all over the world. From her humbleness, doña Rosa shared with us a fraction of her wisdom and hope for humanity, and I was left with nothing but hope and gratitude. Good news! 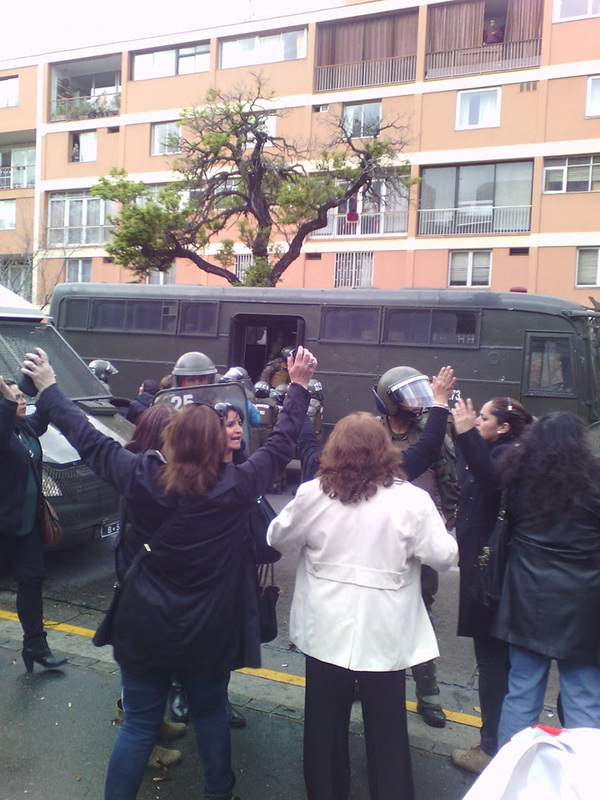 Women across Chile organized, mobilized and shut down, at least for now, the dreaded Monsanto Law. The law would have given multinational corporations the power to patent seeds they discover, develop or modify. For small and mid-sized farmers, which is to say for the rural 99%, this would have been catastrophic. It would have been disastrous for Chile’s `seed heritage’ as well. Women lead the campaign to stop the law, and last week, the government withdrew the bill. On Monday, March 17, Secretary General to the Presidency Ximena Rincón announced the withdrawal. Rincón had long been a leading critic of the bill, both in Parliament and in government more generally. ANAMURI, Asociación Nacional de Mujeres Rurales e Indígenas or the National Association of Rural and Indigenous Women, was a central organizer and mobilizer in the campaign. ANAMURI co-director Alicia Muñoz explained, “All of the resistance that rural organizations, principally indigenous communities, led during these past years was a success. We were able to convey to the parliament how harmful the law would be for the indigenous communities and farmers who feed us all. Big agriculture, or agro-business is just that, a business. It doesn’t feed our country.” In their organizing and mobilizing, ANAMURI explicitly linked the capitalization and commoditization of food and of seeds to capital and to patriarchy. Repeatedly, they stressed that the right to food and the struggle for biodiversity is part of the women’s liberation struggle in Chile and everywhere. Camila Montecinos, of GRAIN, focuses on biodiversity and food sovereignty. Her organization worked with CLOC, la Coordinadora Latinoamericana de Organizaciones del Campo, to organize rural women, workers, and indigenous communities to educate the members of government and the general population as to what is at stake, and again not only for Chile: “This struggle has not ended. Certainly the agrobusiness sector is going to lobby fiercely. We’re ready for that. Sometimes Chile looks like one of the most submissive countries, but if we can win here, others can win elsewhere where similar laws are in place.” In Argentina, for example, women like Sofía Gatica are leading a similar campaign against Monsanto and Monsanto Laws. Lucía Sepúlveda, of Rapal, la Red de Acción en Plaguicidas y sus Alternativas or Alliance for a Better Quality of Life/Pesticide Action Network, has been organizing to stop the destruction of small farms and the resultant production of rural food deserts, in the heart of the farmlands. At the same time, when the bill was pulled, Sepúlveda reminded the women around her that it was originally Michelle Bachelet, in 2009, who originally presented the bill to Parliament. After years of organizing, cajoling, mobilizing, and meeting, Bachelet’s emissary pulled the bill for reconsideration. At the same time, Bachelet announced this week her intention to establish a Ministry for Women and Gender Equality. Alicia Muñoz noted that ANAMURI has been organizing and lobbying for this Ministry since the advent of democracy in Chile. A funny thing happened on the way to austerity. Women workers said, `NO!” And won. This week, it happened in Chile. In December of last year, Piñera was at a summit meeting in Mexico when, to `lighten’ the mood, he told a joke concerning the difference between a politician and a woman. The joke ends as follows: “When a lady says no, she means maybe; when she says maybe, she means yes; when she says yes, then she’s not a woman.” No one in the Chilean women’s movements or sectors laughed. Even Carolina Schmidt, Piñera’s Minister for Women’s Services, publically criticized the President. Sexual violence is not funny. Neither is the exploitation of women workers. This past Sunday, Piñera and his family were on their way to Mass, when three women workers from the Bahía Coique resort stopped him and started shouting. They explained that they had been working for years, were receiving criminally sub-standard and illegal wages, were forced to work too long hours with no time off. Piñera is part-owner of Bahía Coique, in the southern part of Chile. The leader of the trio seems to have been Luz Herrera. She explained that she is a laundry worker who has worked at the resort for nine years. She hasn’t received a raise in three years. The salaries are below the minimum wage. She can’t take care of her family on the money she earns. There’s no contract, there’s no protections, there’s workers’ comp or health insurance. She’s forced to work without breaks and without days off, in the very place that the President goes `to relax’. Piñera vacations, often, at Bahía Coique. That’s where he was when the women workers approached him. He was, no doubt, getting some down time after his grueling time making jokes on the summit. The government response was textbook classic. First, they tried to ignore the women. Then they claimed that Piñera didn’t have any holdings in the resort. Then they argued that the President can’t be expected to pay attention to every detail of his vast holdings. It’s hard to see the workers from the commanding heights. 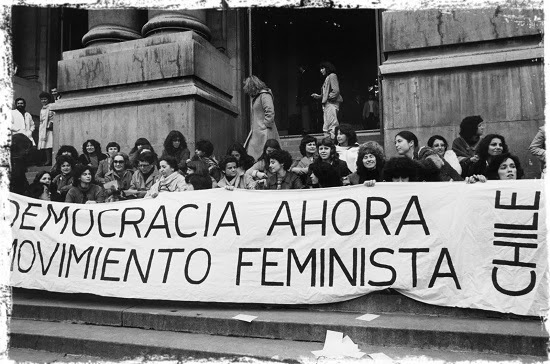 The women students of Chile are indignant. 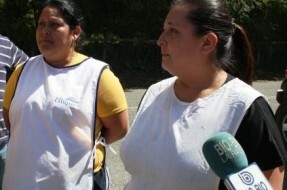 The women workers of Chile are as well. And they are not afraid of anyone or anything. They have begun this, and they will see it to its conclusion. Ask Luz Herrera. Hunger strikers at a secondary school in Buin, near Santiago. For two days this week, the streets of Chile filled with indignation … and indignados. These protests are the latest event in a movement that began over three months ago, with a scattered series of classroom boycotts and protests. Since then, students from secondary and tertiary institutions have led teachers and professors, parents and custodians, trade unionists and government workers in protest, in action, in song and dance, in hunger strike, in organizing. The State has responded by arresting 14,000. Already one 16-year-old has been shot and killed. And now, after waves of protest, after State-sponsored bloodshed and belligerence, the State claims it wants a dialogue. The students began their protests to challenge and change the inequalities within the educational systems and structures, inequalities that are funded, or better de-funded, by mass privatization, on one hand, and a tax structure that sends relatively little money into the schools. Most students attend grossly underfunded public universities while the wealthy few attend the very few exclusive and exclusionary private universities. At present, Chilean university education is one of the most expensive in the world. Students assume extraordinarily high debts, with 50% of them considered heavily indebted. The schools are both expensive and lousy. As inequality has grown in Chile, so has segregation. According to some, Chile is the second most socially segregated country in the world. The rich study – and play and live — only with the rich, the poor with the poor. 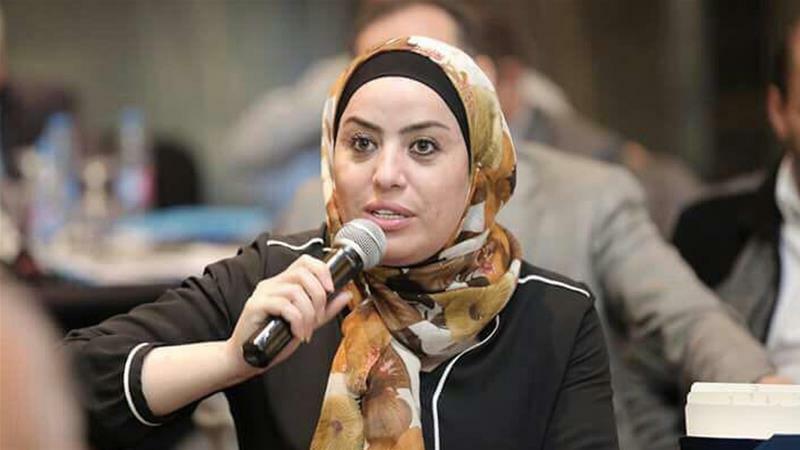 Students began to see the inequality gap as well as the increasing barriers and increasingly high walls as the State condemning them to a slow death sentence. Rather than roll over, they responded with outrage. Women and girls lead the student movement. 23-year-old Camila Vallejo, for example, is the president of the University of Chile’s student union and the principal spokesperson for the Confederation of Chilean University Students. 18-year-old Francia Gárate is on hunger strike. So are 17-year-olds Johanna Choapa and Maura Roque. María José Zúñiga is spokeswoman for secondary school students at Liceo A-131, high school in Buin next to the capital, Santiago. Pictures and articles show innumerable unnamed women and girls on the front lines, at the bullhorns, on the various stages, in the hunger strikes. Why are women leading the charge? For almost four decades, Chile has “manufactured modernity” by relentlessly pursuing a neoliberal economic policy: privatization, free trade, the works. And who “bears the brunt” and who literally does “the dirty work of neoliberalism” in Chile? Women. Who looks at the promises of an `emerging’ first world national economy and sees that the money goes for teargas canisters rather than books, for corporate palaces and hotels rather than classrooms? Who looks at the gap and sees who’s making those decisions? Women. Indignant, insightful women and girls are igniting the Chilean Winter with their outrage.